Ever used the lace stitch? Its not just for delicate patterns. Here I used it for this miniature net and it worked out perfect. 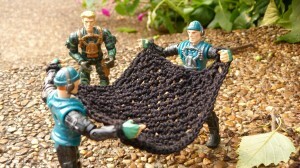 Made for 4 to 4 1/2 inch army men, boys will love to add it to their other military equipment. Its quick and easy to make! Tip: For a thinner netting you could try a smaller size thread. Gauge Swatch: 1’’w x 1’’h (2.5 cm x 2.5 cm) ch 6. Crochet evenly around piece and make a ch 6 and sl st in each corner (instead of the traditional 3 sc in each corner). You should have a loop at each of the 4 corners. If you have any questions along the way leave me a comment below! This entry was posted on Thursday, June 27th, 2013 at 12:00 AM by Amy	and is filed under Free Crochet Patterns. You can follow any responses to this entry through the RSS 2.0 feed. You can skip to the end and leave a response. Pinging is currently not allowed.